When one-a-day simply isn't enough! 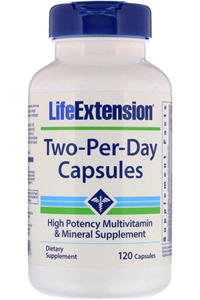 Life Extension Two-per-Day capsules have been formulated in response to the need for higher potency vitamin and mineral supplements. 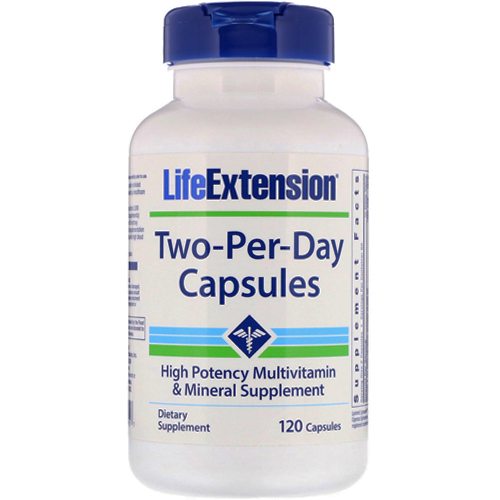 When compared to traditional 'one-a-day' supplements, Life Extension's 'Two-per-Day' Capsules have been found to provide up to 50 times the potency! The problem with many supplements available today is the low quality of the vitamins used, such as synthetic forms instead of natural, which yield very little usable nutrition. The vitamins used in Life Extension Two-per-Day capsules come from natural sources and provide much higher levels of potency. And as if that wasn't enough, more than twice as much niacin and zinc! Read the entire label and follow the directions carefully prior to use. Take two (2) capsules daily in divided doses with meals, or as recommended by a healthcare practitioner. Due to the source of the kelp, this product may contain fish and shellfish. Vitamin D supplementation is not recommended for individuals with high blood calcium levels.